In biventricular physiology, transcatheter right ventricular outflow tract (RVOT) stenting is indicated as an initial palliative alternative to a modified Blalock-Taussig shunt or to delay surgery for obstructed RVOT conduit. RVOT conduits may eventually need replacing because of luminal narrowing, regurgitation, or size mismatch associated with somatic growth. 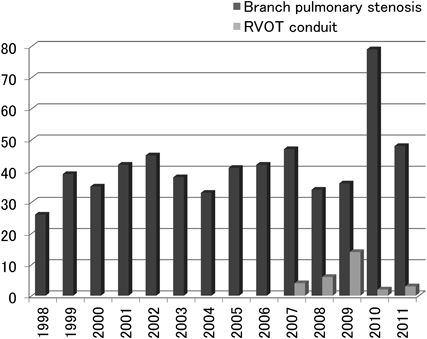 During the 2000s, reports from North America described acutely improved hemodynamics and the ability to postpone surgical replacement for 2.1–3.9 years with endovascular stenting for conduit stenosis. However, common complications of stenting RVOT conduits are free pulmonary regurgitation and frequent stent fracture. In addition, the potential risk of proximal coronary artery compression also limits its use when the anatomy is unfavorable. Recently, transcatheter pulmonary valve implants (TPVI), intended for treating RVOT conduit dysfunction, have become available in Europe and the US. However, size considerations may limit their use to smaller sized RVOT conduits. These uncertainties mean that stenting and surgery will remain necessary therapeutic options for conduit pathology, particularly in Japan where TPVI is unavailable. Given the likelihood of its continued use, we reviewed current trends in stenting for RVOT conduits in Japan and their potential risks and benefits. RVOT, right ventricular outflow tract; op, operetion; RVp, right ventricular pressure; SD, standard deviation. TOF, tetralogy of Fallot; PA/VSD, pulmonary atresia with ventricular septal defect; TGA, transposition of the great arteries; DORV, double outlet right ventricle; Truncus, truncus arteriosus; MLD, minimum lumen diameter; RVD, reference vessel diameter; % stenosis, percent stenosis; PG, pressure gradient. 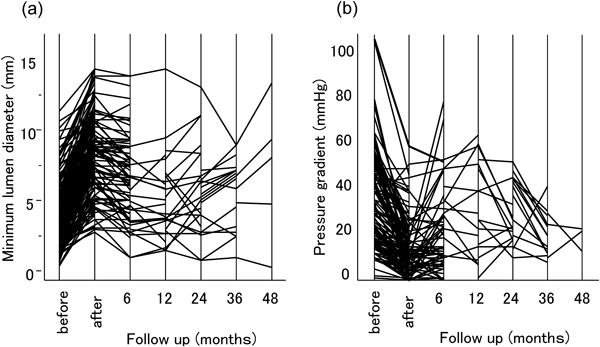 The minimum lumen diameter (a) and the pressure gradient (b) were significantly improved after stenting. 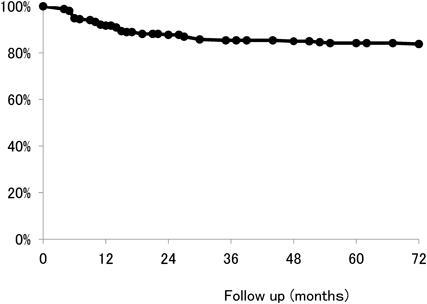 There was no significant exacerbation of the stenosis throughout the follow-up period up to 48 months after stenting. Freedom from re-intervention was gradually decreased to about 90% at 24 months. Then it almost plateaued beyond several years. Percent stenosis (a) and pressure gradient (b) before and after stenting (n＝7). The % stenosis and the pressure gradient decreased immediately after stenting. Stenting for RVOT conduit emerged from 2007, and was performed only several cases a year. Furthermore, most of such cases were stenting for RV-PA shunt following Norwood-Sano operation for hypoplastic left heart syndrome. 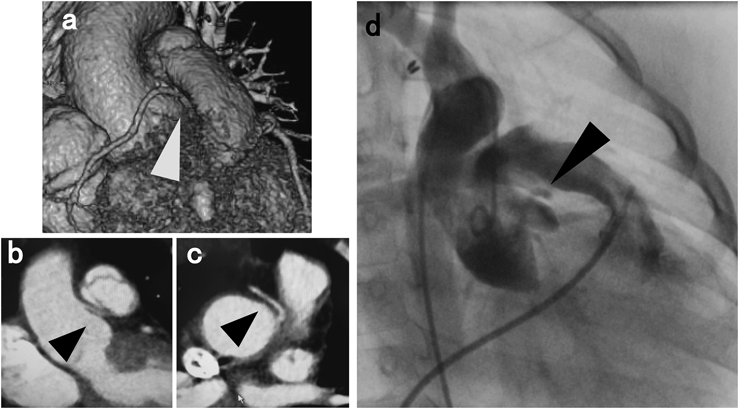 a) Volume rendering image of computed tomography; b), c) Multiplanar reformations image of computed tomography; d) simultaneous angiography of aorta and RVOT conduit. The right coronary artery originates from high left sinus of Valsalva runs just beneath the RVOT conduit. This patient may be at high risk of coronary compression associated with RVOT stenting (black arrow shows right coronary artery just beneath the RVOT conduit). 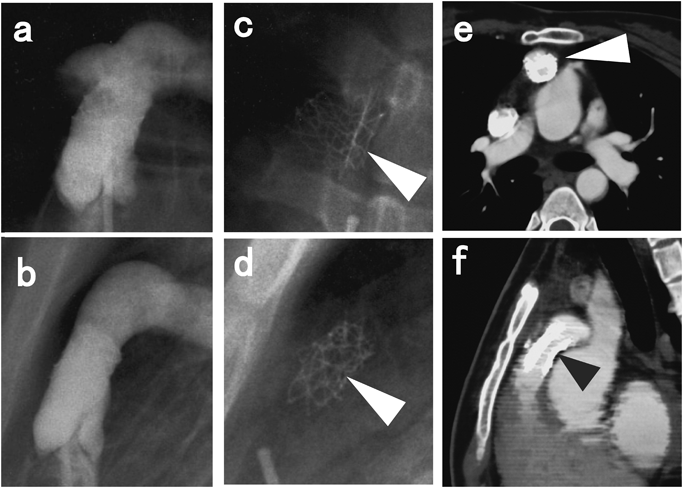 a) Anteroposterior projection of pulmonary angiogram after stent implantation (P1808); b) Lateral projection; c) Anteroposterior view of the fractured stent 7 months after implantation; d) Lateral view; e), f) Computed tomography at the same time (black and white arrow shows fractured stent).